When Bollywood and Hollywood stars are coming together in many movies and even shows, how can producers be far behind. 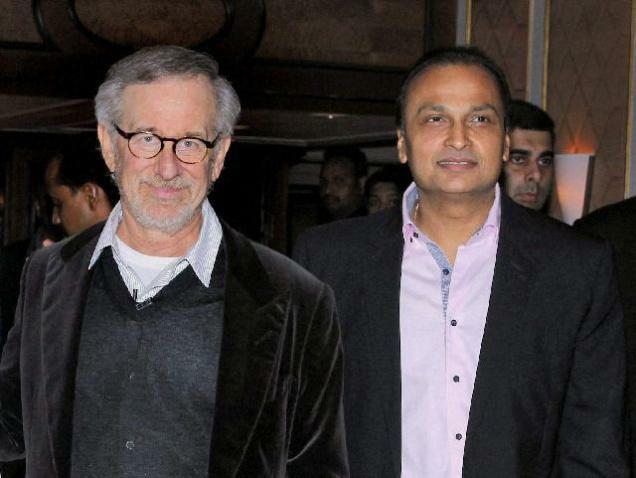 In the latest of collaborations between a Hollywood biggie and an Indian business magnate, director Steven Spielberg ( of Jaws, ET and Jurassic Park fame) and Anil Ambani have come together to form Amblin Partners. The entity will primarily focus on producing and distributing films using the DreamWorks Pictures, Amblin Entertainment and Participant Media brands. Ambani already has a joint venture worth US$1.2 billion with Steven Spielberg’s production company DreamWorks and the tieup has contributed to the production of a number of films with Steven Spielberg, including the Academy Award winning film Lincoln in 2012. The newly formed entity will use the Amblin label for family-friendly movies, the DreamWorks label for adult-themed movies, and the Participant label for social/justice movies, although Participant will remain a separate company. Anil Ambani is one of the largest producers of Bollywood and his major interests in entertainment include 44 FM radio stations, nationwide DTH business, animation studios, and several multiplex cinemas throughout India. Under the Reliance Entertainment umbrella of the Anil Dhirubhai Ambani Group (ADAG), Ambani owns entities like Adlabs media, Bigadda.com, Talenthouse, BigFlix, BigMusic, Phantom films, amongst others.